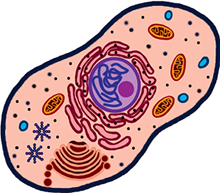 Objective: Today you will look at computer models of different cells, including the animal and plant cells we have been studying in class. You will learn more about the functions and descriptions of the cells and their components (parts). Follow the directions below for each section. Part A: “How Big is...” → On the home page, www.cellsalive.com, scroll down and click on “How Big is…”. Once there click on the red “start the animation” button. Here you will look at objects found on the head of a pin. View the objects by either moving the magnification in and out OR by clicking on the words in blue to the right of the animation. → On the home page, www.cellsalive.com, scroll down and click on “plant/animal” under the “Interactive Cell Models” image. Once there, click on the red “start the animation” button. Select “animal cell”, you will need to “click” on the organelles and parts of the cell to find the information about those parts. Answers to the questions are in the reading. 1. What is the function of the mitochondrion? 2. How big are mitochondria? 3. What does the Golgi do? 5. Where is the nucleolus found? 6. What does the nucleolus do? 7. What does the cytoskeleton do? 8. What is the collective name for the cytosol and organelles? 9. What is the function of the cytosol? 10. What is the function of the lysosome? → On the home page, www.cellsalive.com, scroll down and click on “plant/animal” under the “Interactive Cell Models” image. Once there, click on the red “start the animation” button. Select “plant cell”, you will need to “click” on the organelles and parts of the cell to find the information about those parts. Answers to the questions are in the reading. 11. What other type of cell, besides plant, has a cell wall? 12. What makes the plant cells green? 13. In plant cells, what does the vacuole do? 14. Name 3 parts found in a plant cell that are also found in an animal cell.